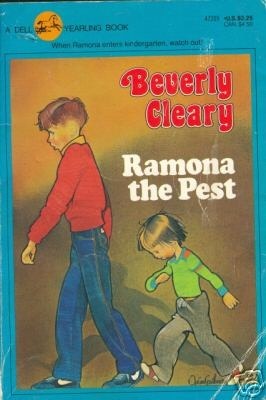 The story: Ramona is finally going to kindergarten after living in the shadow of her sister Beezus for so many years. She loves her teacher, Miss Binney, who seems to be one of the few grownups who truly understands her. But this year is not without trials - Ramona can't seem to stop pulling the curls of one particularly aggravating classmate, her mother forces her to wear ugly hand me down boots, and she even has to endure a substitute teacher! Mama opines: I loved this series as a child and I'm really enjoying reading it with David. Ramona is the original precocious child and I think a lot of little kids relate to her excitement about finally being one of the big kids. As grownups, we sometimes forget about a lot of the things that really matter to little ones. Ramona helps us remember and perhaps even relate to our little ones a bit better. This is truly a wonderful book. If you haven't read it yet with your son or daughter, get to it! Thoughts from David: I love Framona the pest because it is the weirdest thing in the whole book land. I love it because it is so so awesome. It was the amazingest book I have ever seen in my life. Favorite part: My favorite part is when Ramona the pest dresses up in a witch costume. I'm having the best time reading books that I loved as a child with him. Thanks for stopping by to check out what we are reading!